Databases are at the heart of our counter-terrorism operations, especially those than can prevent travel. 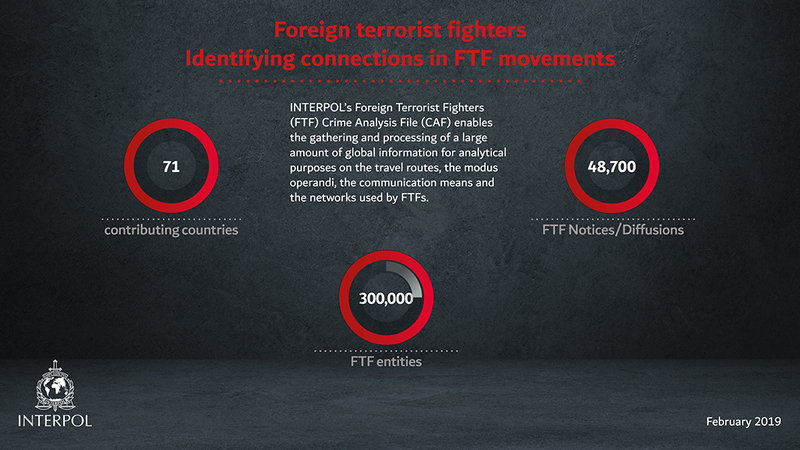 Our databases contain details of around 48,700 foreign terrorist fighters. This makes INTERPOL the world’s largest repository of such information, which could prove vital in identifying returnees. Data is collected from a number of hotspots including borders, battlefields and prisons. Stolen travel documents are a key asset for terrorist mobility, particularly for foreign terrorist fighters returning from conflict zones. This makes it vital for border officials to check travellers’ identity and passport information against INTERPOL’s database of stolen and lost travel documents. Other databases crucial to strong border management are the INTERPOL nominal database − which contains details of the personal data and criminal history of individuals subject to a request for international cooperation − and the database of Travel Documents Associated with Notices. Our experts analyse the data and share insights with our membership, for example, intelligence on emerging trends related to foreign terrorist fighters.